Exterior view of the main house at Grouseland, the home built by William Henry Harrison in Vincennes, Indiana, ca. 1920-1960. The Indiana Territory at its greatest extent included modern-day Indiana, Illinois, Wisconsin, Michigan and part of Minnesota. It formerly was part of the Northwest Territory. 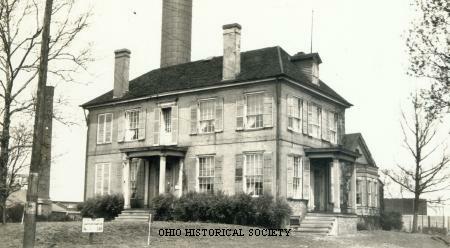 As Ohio began the process of becoming a state in 1800, the Congress separated the area into two distinct territories. William Henry Harrison served as the first governor of the Indiana Territory and was in office until 1812. As governor, Harrison ruled strictly. Many white settlers in the area were opposed to slavery and it had been prohibited by the Northwest Ordinance of 1787. Harrison was from a prominent slaveholding family and did not vigorously enforce the law against slavery in the Indiana Territory. He did permit the formation of a territorial legislature in 1805, but he ignored most of its requests. His authority remained virtually unchallenged until 1809, when the United States government separated modern-day Indiana from the other land originally included in the Indiana Territory. Many of the residents still under his leadership disliked the governor. In 1810, the legislature outlawed slavery and ended land ownership as a requirement for adult white men to be able to vote. Harrison's strict rule is surprising. When he resided in what would become Ohio, he strongly opposed the strict rule of Northwest Territorial Governor Arthur St. Clair. Harrison's actions suggest that he was less upset with St. Clair's political views and more angered by his own lack of power. Although Harrison was not well liked by some of his constituents, he did do much to enhance the power of the United States in the early 1800s. While he served as governor, Harrison also worked as the Superintendent for Indian Affairs in the American Northwest. He convinced many Native Americans to relinquish millions of acres of land in the former Northwest Territory. This was in spite of the fact that the United States had promised this land to the Indians in the Treaty of Greeneville of 1795. Not all tribes were willing to give up their claims to the land. Chief among these people were the Shawnee Indians, led by Tecumseh and his brother, the Shawnee Prophet. These two men worked together to form a confederation of all Indian tribes west of the Appalachian Mountains. Harrison marched against Tecumseh in late 1811. While Tecumseh was away seeking additional followers, Harrison attacked the Shawnees' major village, Prophetstown. Prophetstown was located at the junction of the Tippecanoe River and the Wabash River in modern-day Indiana. On November 7, 1811, at the Battle of Tippecanoe, the American army destroyed the village.